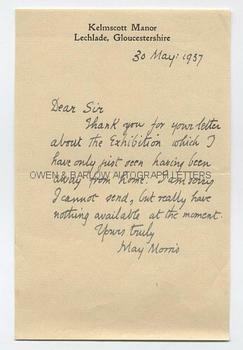 MAY MORRIS Autograph LETTER Signed. English embroidery designer, artisan and socialist. The youngest daughter of Pre-Raphaelite designer, William Morris and the artists model, Jane Morris nee Burden. ALS. 1p. Kelmscott Manor, Lechlade, Gloucestershire. 30th May 1937. To "Dear Sir" [Victor Hume Moody]. "Thank you for your LETTER about the Exhibition which I have only just seen having been away from home. I am sorry I cannot send, but really have nothing available at the moment." 12mo. Approx 7 x 4.5 inches. Fine. Mary "May" Morris was a great beauty in her youth and was immortalized by her father's friend (and her mother's lover) Dante Gabriel Rossetti in his 1872 portrait. From the studio archive of the Malvern artists Victor Hume Moody and his daughter Catherine. V.H. Moody was principal of the Malvern School of Art (1935-1962), in which post he was succeeded by his daughter. He is sometimes known as "the last classicist" painter and he and his daughter were opposed to the onset of modernism in art. He organised several exhibitions, sometimes in collaboration with the Malvern Festival, and it was no doubt in this connection that May Morris is writing.